Working from home has benefits when it comes to eating healthy meals during the day but I find myself in a rut. There are only so many days you can eat the same thing for breakfast and lunch. My daily routine is the following - Breakfast: Egg white omelet w/ spinach & mushrooms OR a protein berry smoothie. Lunch: Ground Turkey Breast turned into a bowl of some sort. Because of my daily routine, I find myself bored and looking for any opportunity to go out to lunch and eat god knows what. I was instantly intrigued when asked to review a cooler from Diet-to-Go Mail Order Diet Delivery . 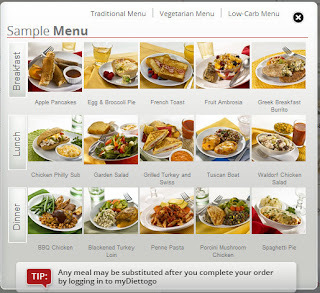 Diet to go offers Low Carb Diet Meals, low fat meals and vegetarian meals. If there is something you do not wish to receive on your weekly menu, you can substitute it for another meal at checkout. I selected the traditional low fat cooler which included 3 meals a day for five days, including snacks. The timing of my review on Diet to Go was perfect as it arrived just before Gabe left for a week long surf trip to Nicaragua. While I love to cook, I do not like cooking for one. I had a meal plan set out for me and didn't have to go to the grocery store while Gabe was away - perfect! I was beyond impressed with Diet to Go. Nearly everything I had was beyond my expectations. The food was flavorful and did not even resemble a meal out of my freezer. Below are a few of my favorite meals on Week 3 - Diet to Go.